North Korea has lost Internet connectivity. 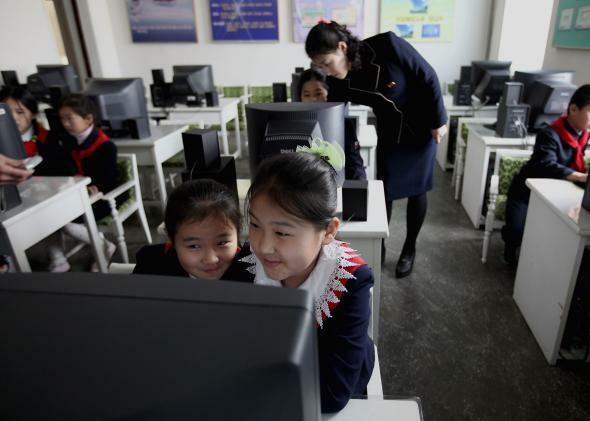 North Korean kids in computer class in 2011. North Korea’s Internet is down. And this isn’t just the result of a weird accident or a broken modem. Something’s up, and it probably has to do with the Sony Pictures hack. The New York Times reports that the country, which doesn’t have a ton of Internet connections to begin with, has had inconsistent access for a few days and is now experiencing a total outage. Most North Koreans are presumably unaware of the situation since they don’t have Web access anyway, but for the nation’s elites, the outage would be noticeable. The country has roughly 1,024 IP addresses or slightly more, but that is compared with millions or billions in most countries. The U.S. Department of Defense alone has more than 200 million IP addresses. It’s possible that the loss of connectivity is an offensive move by the United States. Last week, President Obama promised a “proportional response” to the Sony Pictures hack as U.S. government sources began confirming that they suspected North Korea-sponsored hackers were behind the cyberattack. As the Times notes, it’s unlikely that the U.S. would ever confirm that it caused the outage. In the past the U.S. has also shied away from cyberattacks that limit citizens’ Internet access, but perhaps it would make an exception for a place like North Korea where most people don’t have the option of connectivity anyway. There are many potential alternative explanations as well. Anti-North Korean hacktivists could have attacked the nation’s network, though no groups have come forward yet. North Korea might also be shoring up defenses for an anticipated attack, or preparing to launch another one of its own. Meanwhile, as if things weren’t weird enough, White House National Security Council spokesperson Bernadette Meehan told Fox News, “We have no new information to share regarding North Korea today … If in fact North Korea’s Internet has gone down, we’d refer you to that government for comment.” Oh OK, so just casually contact a reclusive regime that doesn’t even have an Internet connection right now. Got it, thanks. *Correction, Dec. 22, 2014, 7 p.m.: This article originally misstated that North Korea had commented that its Internet outage was due to upgrades on its network. The country actually has not commented on the reason for the outage. The tweet stating this and references to it have been removed.